Town have confirmed the loan signing of Aston Villa right-back James Bree for the remainder of the season. News that Town were targeting the former Barnsley man broke earlier this afternoon with manager Paul Lambert remaining tight-lipped at his press conference when quizzed about the Wakefield-born defender. TWTD subsequently revealed that he was at Portman Road. 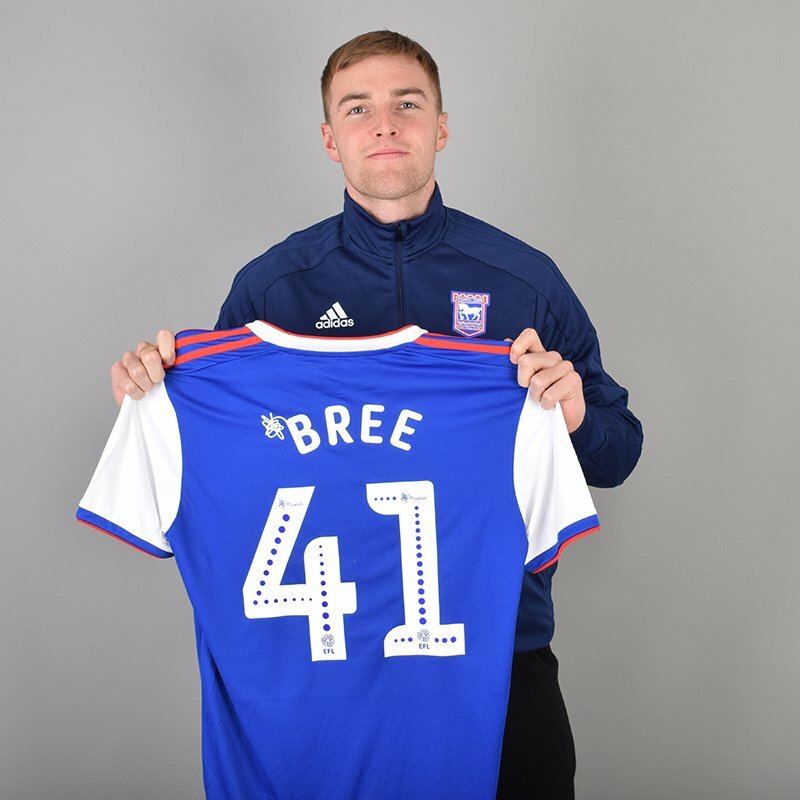 Bree, who wil wear the Town number 41 shirt, has made only eight Championship appearances for Villa this season having joined them from the Tykes in January 2017. He is contracted until the summer of 2021. Bree’s recruitment could see on-loan Everton defender Matthew Pennington leave the Blues to join Derby on loan for the second half of the season with a view to the move being turned into a permanent switch in the summer. Meanwhile, ex-Blues left-back Tyrone Mings has joined Villa on loan for the rest of the season from AFC Bournemouth. Know nothing about him at all, good luck to him. Wonder where this leaves Emmanuel. Never been given a fair crack at ITFC. Makes no difference. He won’t be playing for us next season. Nor Pennington. I guess we can Bree'th a bit easier when it comes to defense? This signing makes no sense. What about Josh Emmanuel now? He's better than Spence, same age as this guy and has a promotion medal with Rotherham. I thought Lambert was giving more of our own grown talent a shot and we sign this guy who according to Harry from Bath isn't up to much and he's not usually wrong..
Shame about Pennington, I was hoping that this signing would mean Chambers being dropped! !!!!! I really want to eat my words..and hope i do BUT we are going down arent we? So why the hell have we got yet another player who wont be here next season??.. what arent we preparing for league one so we hit the ground running in August? and have best chance of bouncing straight back up.. Surely that has to be done with youth..we have them...lets play them and get them up and running for August. This is all short term fantasy that we MIGHT escape..it ain't gonna happen..
Will someone at PR please get real ffs! we are going down and all these journeymen will be gone in May. Leaving us to to start over in August playing already settled and established League 1 sides. If anyone thinks league 1 will be a doddle then they are sorely mistaken. I watch a lot of national league football (mostly Orient) and can tell you the quality at even that level is better than some of the dross served up this season in the championship! I do think Lambert is the man for us. But he's doing one thing the same as Hurst - Too many new faces at the same time. Difference? - its way too late now to make a difference and these ones won't be here come May. Start to build something with solidity, with some foundations...not another house of cards that needs to be re-built again in May/June/July. So much effing panic on this bloody forum. Christ, PL SAID he was doing a salvage Jorge first and foremost those season with half an eye on next season. Question: would we seriously look to ( be able to) sign Pennington when in League One? Question: is Pennington a right back ? No. Is Bree ? Yes! Question : How many loanees can we have in a match day squad? So it’s snout round pegs in round holes- we’ve all moaned about the lack of this for so long. Now PL is STARTING to get the right people in don’t bloody knock him for it. Ok. Great. Fully understand we need a right back. We have needed a right back for how many years. But for god sake, we need a right back that will be here for longer than this May. We need a right back that’s ours surly. So many happy with whatever is thrown at them. This is all a shambles. The shambles goes on. And many on here think we’ll come straight back up. Dream on. Agree with Arnie M, PL is doing a patchup job this month to solve a problem that mainly occured in the summer with PH bringing in too many lower league players into a tough division, although if I'm honest a problem has been brewing for many seasons. Apparently many Villa supporters are very unhappy that Bree has been shipped out. Lets give all the new boys a chance though. A win on saturday and if other results go our way could see us 4 points adrift, although it would still mean we would need to win 2 more matches than Rotherham. Realistically I felt the damage was done after the Millwall game, but you never know in football!! Welcome James - hope you will do well here. Pennington clearly wants the Derby move as it could lead to long term signing, that leaves us short at right back. So we play Emannuel and heaven forbid he gets injured.....then what? Spence back in?! And to talk of full preparation mode for league 1 already bemuses me. How can PL throw in the towel now? He came here to try and save our status and I believe is doing everything he can to do so. He's restructered the defence once, Pennington moves on and he's filled the hole. What more can we ask for? At least we already know what his favourite cheese is. Welcome James. Hope you are a success. My question would be, if Pennington is good enough for Derby, why isn't he good enough for us. ArnieM. Normally in total agreement with all you write. You have baffled me here though. Salvage what? Surly more important to plan for next and coming seasons. There’s been to many years of here and now planning. Hence where we are. The half an eye on next season has been shown by doing what exactly? We needed full backs that are ours but bring in loans. We needed strikers that are ours for the long term. We bring in the opposite. We needed quality midfield players that are ours for the future, we do the opposite. The quality young midfielders we do have on the books don’t look like getting a run in the team anytime soon. And in some respects have been billed as not upto it. We needed to improve the centre of defence, not just for now but for seasons ahead. Again nothing done. FFS - you people on here are deluded.. one of our glaring issues all season has been a RB. Everyone wingers about it. There - PL has gone out to solve it. This guy was extremely decent for Barnsley - exactly why Villa (who were ‘destined’ to go straight back up last season bought him. Because he is decent and would fit into a top team challenging for the prem. PL has done everything we / the club needed - yet some of you have still got the audacity to slate the player and PL. PL has now addressed all the obvious issues - with a little bit of luck and some of the stuff which has gone against us so far - if these guys gel in the next fe weeks maybe, just maybe we can have a run at the end of the season and possibly scrape 21st place. IF we do go down, then PL will (with my complete trust based on his dealings so far) know who’ll remain, who’ll go and the type of players we need. Blame Hur*t for our position, not the new players and PL. With the best resources possible I’m absolutely loving his transfer dealings - every one of them. Ipswichheritage, I couldn't agree more. Seems resolving the glaring shortfalls with whatever resources are on offer just isn't good enough?! Ipswich heritage. Sounds to me you’ll be content when we’re in L2.